The career path for executives, managers and team members in GRC is expanding faster than ever before. Just a few years ago it looked like a meandering unpaved trail, and today it more resembles a multi-lane super highway. Do you have the skills and knowledge you need to perform as a contributing member of a modern GRC team? And if you are building that team, do you know what to look for as you screen resumes? Join OCEG and Compliance Search Group for an in depth and enlightening discussion of how today’s (and tomorrow’s) top GRC professionals land jobs in which they contribute to organizational success and are recognized as key contributors to business performance. Are you working in risk management, compliance, audit, IT, legal, HR or another GRC role and you want to enhance your visibility and value in your organization? This event is for you. Are you building a GRC team, or looking for ways to educate and advance the team you have? This event is for you. Are you thinking about entering a GRC field and want to know how to begin building your resume? This event is for you. 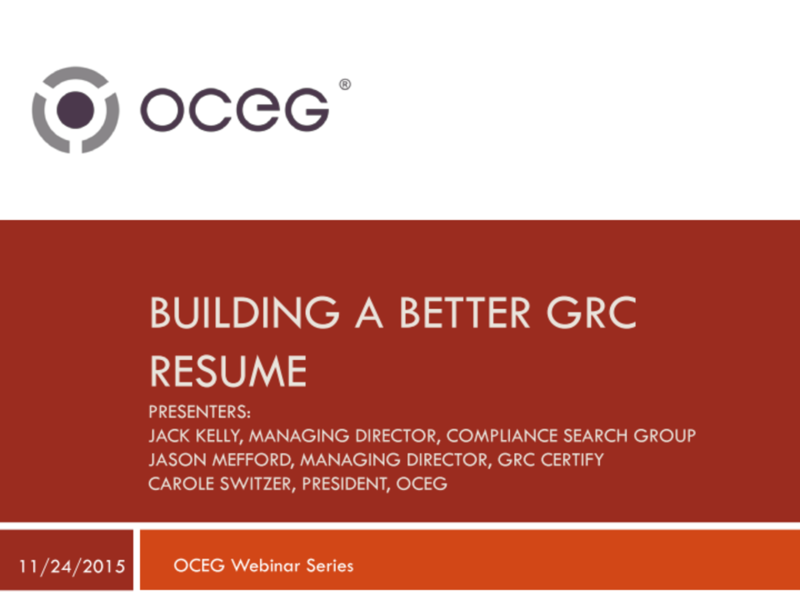 We have emailed instructions to access Building a Better GRC Resume Slide Deck to . Make sure the email arrives in your inbox: either add "support@oceg.org" as a safe sender to your email platform, or if you use Gmail, drag our email into your Primary tab.